It wouldn't be the holiday season without a quilting project! 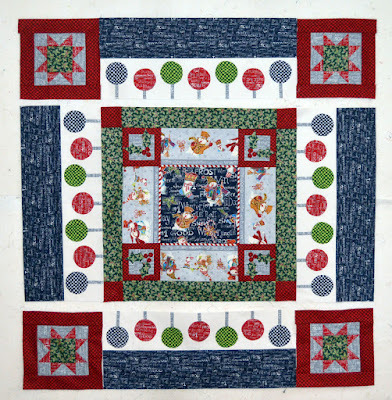 Follow along as we use Judy Hansen's A Snow Family Christmas collection to make a medallion quilt perfect for winter! We'll start with a center square and add easy borders to create a 54" square quilt. Follow along as work toward the final quilt reveal. Woo hoo! It's time to finish the quilt! This is quick and easy because you've already constructed the sections to do so! Step 1: Sew each ornament applique row to a 6-1/2" x 30-1/2" navy text print strip. Step 2: On your design wall, lay out the quilt center, the four outer border rows, and the four star corner blocks as shown. Sew outer border rows to opposite sides of the quilt center. Sew star corner blocks to both ends of the remaining outer border rows. Step 3: Add the top and bottom border rows to complete the quilt! We wish there was snow to make this photo a little more seasonally festive...ignore the brown leaves! Step 4: Layer backing fabric, batting, and quilt top right side up. Baste the layers together and quilt as desired. Use (6) 2-1/4" x 42" red check strips to bind the quilt. Enjoy! Follow along as we make our Medallion quilt! 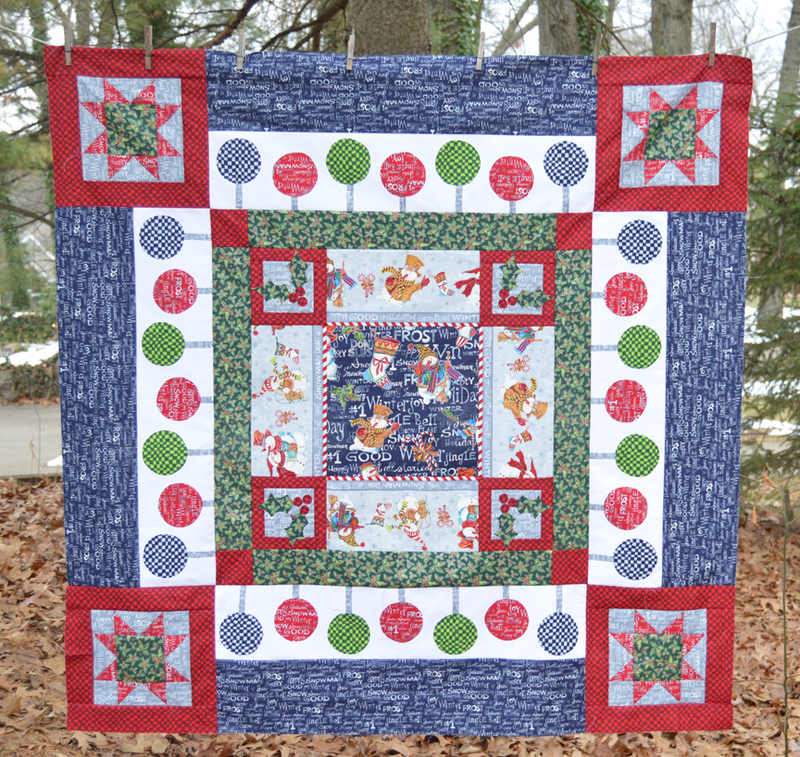 See the entire A Snow Family Christmas collection here and ask for it at your local quilt shop. Thank you for the cute pattern.I hope to start this after the new year. What a great pattern. So nice to see the whole process. Make your own star with Fabriflair! In Love with Tree Skirts!